Cushing’s Disease (Cushing’s Syndrome; Hypercortisolism; Adrenal Hyperfunction) is a cluster of clinical abnormalities caused by excessive levels of adrenocortical hormones (particularly cortisol) or related corticosteroids and, to a lesser extent, androgens and aldosterone. The disorder is caused by adrenocortical hyperplasia (overgrowth of adrenal cortex) secondary to pituitary overproduction of adrenocorticotropic hormone (ACTH), benign or malignant adrenal tumors that release excess glucocorticoids into the blood, prolonged or excessive administration of corticosteroids. The disease results in altered fat distribution, compromised immune system, disturbances in protein metabolism, and fluid and electrolyte imbalances. 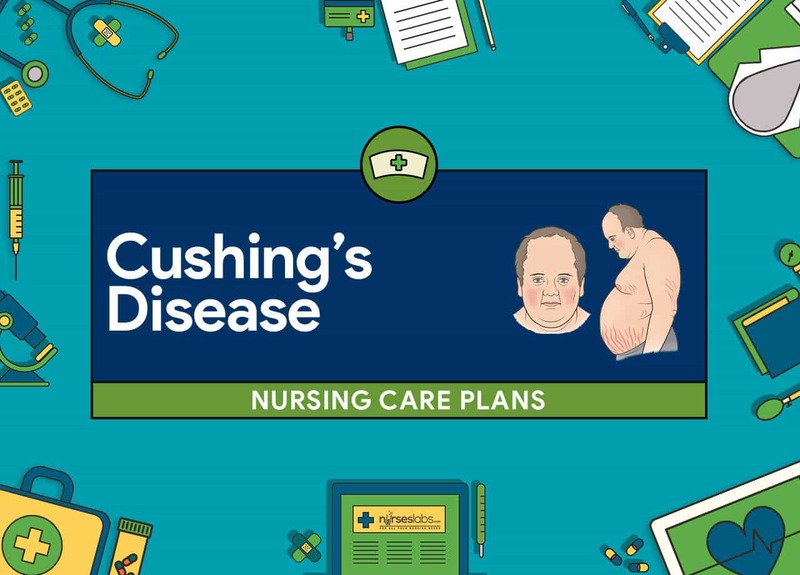 Changes in the physical appearance associated with Cushing’s disease can have a notable influence on client’s body image and emotional well-being. The focus of this care plan is promoting skin integrity, improving body image, decreasing the risk of injury and improving thought processes. Risk for Excess Fluid Volume: Defined as increased isotonic fluid retention. Retention of water and sodium caused by an excess of cortisol and mineralocorticoid levels. Client will be normovolemic as evidenced by stable weight (or loss attributed to fluid loss), urinary output 30ml/hr or greater, balanced intake and output, absence or reduction of edema, HR less than 100 beats per minute, absence signs of pulmonary congestion. Detection of signs of circulatory overload will help in the immediate intervention. Due to excessive glucocorticoid and mineralocorticoid secretion, the client is predisposed to water and sodium retention. Assess for cardiac dysrhythmias As the level of potassium decreases in Cushing’s syndrome, the chances of abnormal heart rhythms increases. Monitor vital signs, especially BP and HR. Cushing’s disease may result in increased blood pressure resulted from the expanded fluid volume with sodium and water retention. Tachycardia happens as a compensatory response to circulatory overload. Monitor the client’s sodium and potassium levels. Excessive cortisol causes sodium and water retention, edema, and increased potassium excretion. Mineralocorticoids regulate sodium and potassium secretion, and excess levels cause marked sodium and water retention as well as marked hypokalemia. Instruct the client to elevate feet when sitting down. This position decreases fluid accumulation in the lower extremities. Instruct the client to reduce fluid intake as indicated. Limiting fluid intake is important in preventing circulatory overload. Encourage the client to have low sodium and high potassium diet. Too much sodium in the diet promotes fluid retention and weight gain. There should be an adequate potassium in the diet since the elevation of cortisol level causes hypokalemia. Administer antihypertensive medications as prescribed. Cortisol and mineralocorticoid excess causes increase blood pressure as a result of sodium and water retention. Administer diuretics as prescribed. Diuretics promote sodium and water excretion. Potassium-sparing diuretics such as Spironolactone (Aldactone) may also be prescribed to prevent additional loss of potassium.